It gives me real delight to join you at the Luncheon of the Hong Kong Association. In just a month's time, we will celebrate the 20th anniversary of Hong Kong's return to China. The first of July twenty years ago was a truly historic milestone. On that day, the Chinese Government resumed the exercise of sovereignty over Hong Kong. After a hundred years of separation, Hong Kong was finally reunited with the motherland. From then on, Hong Kong entered a new era. Personally, that was also an unforgettable moment in my diplomatic career. I was at the handover ceremony on that historic day. I have since felt a strong bound to Hong Kong. For the past twenty years, I have followed the development of Hong Kong very closely and with great interest. Therefore, I truly welcome today's opportunity to share with you some of my observations and thoughts on Hong Kong. In the past twenty years, with the strong support of the Chinese Central Government and the concerted efforts of 1.3 billion Chinese people, Hong Kong has kept forging ahead against rain and wind. For Hong Kong, these have been two decades of remarkable achievements. First, the past two decades have witnessed the successful practice of "One Country Two Systems". For twenty years, the Central Government of China has consistently and strictly adhered to the Constitution and the Basic Law. The Chinese Government has been firmly committed to the principles of "One Country Two Systems", "Hong Kong people governing Hong Kong" and "high degree of autonomy". The capitalist social and economic system in Hong Kong has remained unchanged. The same is true for Hong Kong's way of life. The legal system of Hong Kong in general is kept intact. The huge success of "One Country Two Systems" has been widely recognized not only in Hong Kong but also in the wider international community. Second, the past two decades have witnessed the steady advance of democratic governance in Hong Kong. The Central Government and the government of Hong Kong SAR have worked hard to advance Hong Kong's democratic governance. This has been done steadily and in accordance with the Basic Law and the decisions of the NPC Standing Committee. There is greater democracy in the election of the Chief Executive and the Legislative Council. The people of Hong Kong have enjoyed unprecedented democratic rights and greater freedom than ever before in their history. For six years, Hong Kong has topped the world's Human Freedom Index. In terms of the rule-of-law, which has been a focus of attention, Hong Kong's world ranking has risen significantly from the 60th in 1996 to the 11th in 2015. Third, the past two decades have witnessed tremendous economic prosperity and social progress in Hong Kong. Hong Kong has successfully withstood the tests of three major challenges: first the Asian financial upheavals, then the SARS epidemic, and later the international financial crisis. Hong Kong's economic output doubled in two decades. Hong Kong has ranked continuously as the most free economy and one of the most competitive economies in the world. Today, Hong Kong continues to enjoy global prestige as a financial, trade and shipping centre. For China's mainland, Hong Kong has long been the largest source of overseas direct investment and an overseas financing centre. In recent years, Hong Kong has grown into an important strategic platform for RMB internationalization. According to the World Bank's Worldwide Governance Indicators, in terms of political stability and absence of violence, government effectiveness, regulatory quality, rule of Law, control of corruption, and voice and accountability, Hong Kong is doing much better than before 1997. Fourth, the past two decades have also witnessed the ever-expanding ties between Hong Kong and the world. With the strong support of the Central Government, Hong Kong has enjoyed ever-expanding ties with the world and growing global influence. Hong Kong hosted the equestrian events during the 2008 Beijing Olympic Games. Hong Kong also hosted a number of major international events including the fifth East Asian Games and ten annual events of Asian Financial Forum in as many years. As a Chinese saying goes, "Greatness is nurtured through difficulties." What Hong Kong has achieved in the past twenty years has not come easily and deserves to be cherished. However, in Hong Kong and the world today, there are still lingering misunderstanding or skepticism about "One Country Two Systems" and Hong Kong's development. They boil down to the questions of how to perceive the problems that Hong Kong faces now and how to appreciate Hong Kong's future prospects. Let me make three suggestions with regard to these questions. First, we should look at "One Country Two Systems" from a historical perspective. Mr. Deng Xiaoping once said, "In essence, the continued prosperity of Hong Kong depends on the implementation of suitable policies under Chinese jurisdiction once China has reclaimed Hong Kong." The practice of "One Country Two Systems" over the past years has shown this to be a suitable policy for Hong Kong. This policy is full of vitality. It has promoted the common development of China's mainland and Hong Kong. It has been the fundamental guarantee for Hong Kong's long term prosperity and stability. It has proved to be the best institutional arrangement. Nowhere else in the world today are capitalist and socialist systems found coexisting under "one country". It is fair to say that "One Country Two Systems" is a pioneering undertaking. It is an unprecedented political and social formula. There is no beaten path to follow. So we have to "cross the river by feeling the stones", as Mr. Deng said. That means we learn and grow at the same time as we overcome difficulties. There is an old saying in China: "We can not simply assume the trend ahead when it is still unclear; nor can we go against the trend when it becomes clear." I would like to once again stress the following. Whatever happens, the Chinese Central Government will uphold national sovereignty, security and development interests. Whatever happens, we will maintain Hong Kong's long-term prosperity and stability. These commitments will not change. Our determination to follow through the "One Country Two Systems" policy is steadfast. We will continue to strictly adhere to the Constitution and the Basic Law. This is to ensure that the "One Country Two Systems" policy in Hong Kong stays on track and will be correctly followed out without any distortion. Second, we should look at Hong Kong's return from a realist perspective. Hong Kong has returned to China. Hong Kong is China's Hong Kong. Regrettably, there has been some unhealthy trend in Hong Kong in recent years. Some people, in Hong Kong or outside, refuse to face up to the fact that Hong Kong has returned to China. They are still lost in the illusion of colonialism. "One single tree can never make a forest." The Hong Kong people share indivisible blood ties with the people of the motherland. Hong Kong's future is closely tied to the future of the motherland. The Chinese Central Government fully endorses the development of Hong Kong and its external exchanges and cooperation. But we are firmly opposed to any external inference in Hong Kong whatever the excuse. China brooks no separation and the so-called Hong Kong independence is out of the question. Twenty years ago, China and Britain successfully solved the question of Hong Kong through peaceful negotiation. This has set a good example for the resolution of historical issues between states. China and Britain remain committed to the "One Country Two Systems", uphold the prosperity and stability in Hong Kong, and oppose to "Hong Kong independence". This is an important agreement between China and Britain. This is the prevailing trend. It calls on all those who want the best for Hong Kong to adopt the right approach and contribute to prosperity and stability in Hong Kong. Third, we should look at Hong Kong's future from a long-term perspective. Hong Kong has the backing of its motherland and close ties with the world. This has always been Hong Kong's most outstanding geographical advantage. As a global financial, trade and shipping centre, Hong Kong has always been at the forefront of China's reform and opening-up endeavor. It is China's gateway to the world. Thanks to "One Country Two Systems" and the preferential policy that gives Hong Kong the "license" to try out new things, Hong Kong and China's mainland have maintained ever closer economic ties. Now Hong Kong-Shenzhen stock exchange connection is already in place. This year, a bond connection scheme will be piloted. The overall planning for the development of the Guangdong-Hong Kong-Macau bay area is also taking shape. As a Chinese saying goes, "Small streams flow when the big river has water." The growth and development of China has always been a fundamental source of Hong Kong's prosperity. China is the world's second largest economy. Reform and opening-up continues to deepen. Hong Kong's role in China's growth and opening-up is not weakened, but further consolidated. It has more strength to leverage and enjoys more promising prospects. Last month, Chief Executive Leung Chun-ying led a delegation to the Belt and Road Forum for International Cooperation in Beijing. That was an international gathering for discussing cooperation. The Belt and Road Initiative is an opportunity for Hong Kong. Hong Kong will achieve greater development by leveraging its unique advantages in RMB internationalization, international asset management, and legal consulting. 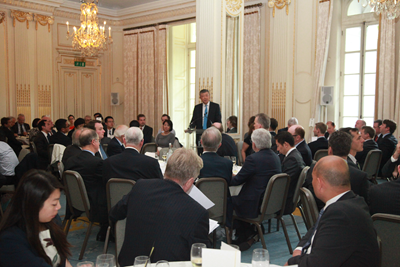 For the past decades, the Hong Kong Association and the British business community have made important contribution to the prosperity and stability of Hong Kong and the healthy growth of China-UK relations. I highly commend your contribution. First, stay committed to upholding "One Country Two Systems". This policy is the cornerstone of Hong Kong's prosperity and stability. Maintaining Hong Kong's prosperity and stability serves the interests of not only China and Hong Kong but also investors from around the world, including Britain. I must make it very clear that the so-called "Hong Kong independence" has crossed the bottom line of "One Country Two Systems". It poses severe threat to the prosperity and stability in Hong Kong. Some independence activists not only make troubles in Hong Kong. They even attempt to seek support here in the UK. I hope the members of the Hong Kong Association will continue to care and support for Hong Kong's development. I also hope you will alert the British public against the harms of "Hong Kong independence" and encourage them to come together to maintain the foundation of Hong Kong's prosperity and stability. Second, I hope you will stay committed to building the China-UK friendship. 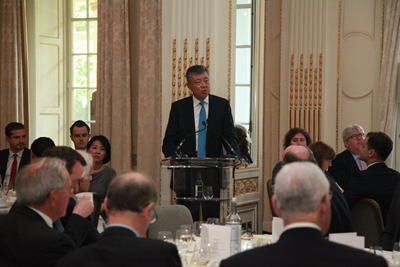 I hope members of the Hong Kong Association will continue to care and support China-UK relations. I hope you will play your part in shaping the objective and fair public opinion on Hong Kong. This will help build extensive and solid public support for China-UK ties. Your efforts will help ensure that Hong Kong will continue to be a positive factor and contribute more positive energy to China-UK relations. Third, I hope you will stay committed to closer China-UK cooperation on the Belt and Road. 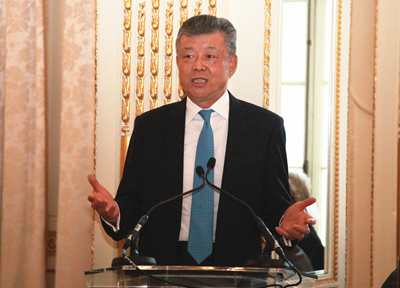 The Belt and Road cooperation is a new highlight of China-UK cooperation. There is huge business opportunities and much untapped cooperation potential in the Belt and Road Initiative. UK has a key role to play in building the Belt and Road. So does Hong Kong. Both are strong in finance, trade, shipping and law. Both have rich experience from past cooperation in these fields. I hope that the UK and Hong Kong could put their strengths together and play a positive role in building the Belt and Road. This year marks the 20th anniversary of Hong Kong's return. This is a landmark in Hong Kong's history. It will also be a new starting point of a journey towards a more promising future for Hong Kong. We look forward to joining hands with British business community to forge ahead together against all odds. I am confident that with concerted efforts, we will help Hong Kong write new success stories on the way forward. And to the health of each and every friend present.